SkyLIGHT™ VCX is the industry’s first performance assurance controller employing Network Function Virtualization (NFV) to bring advanced monitoring capabilities network-wide, without the need for expensive, high-end test equipment. This radically efficient approach to network performance monitoring combines all the benefits of virtualization without compromising test speed or precision. By eliminating key cost, scalability, and coverage barriers to network performance visibility, enterprises can now more cost-effectively ensure a better quality of experience (QoE) for users. SkyLIGHT VCX works together with Accedian’s Nano Smart SFP (optical transponder) and compact gigabit Ethernet Modules to deliver multi-flow traffic generation and the ability to monitor the performance of tens of thousands of flows. The modules are easy to install and cost up to 90% less than existing solutions, enabling enterprise IT teams to realize the significant capital and operational efficiencies promised by a virtualized network architecture, while their customers benefit from a fully assured network. Designed to fit seamlessly into a enterprise’s existing IT infrastructure and operational processes, the VCX Controller uses the same interfaces as Accedian standalone solutions to interoperate openly with standards-based network elements, management platforms, analytics platforms, and more. The result combines centralized control with distributed firepower. This approach is unique in its scalability, and its ability to openly interface network-wide intelligence with existing infrastructure, management, and control platforms. Don’t Promise Performance. Deliver It. SkyLIGHT VCX offers enhanced network performance, Quality of Service (QoS) and Quality of Experience (QoE) visibility—at a fraction of the cost of traditional solutions. Applications as diverse as virtualized customer premises equipment (vCPE), mobile network monitoring, and financial services transaction assurance can all be implemented simply, quickly, and ubiquitously. SkyLIGHT VCX was crafted from the code, packet processing technology, and over forty patents that Accedian introduced to transform industry-standard network interface devices into fully capable Network Performance Elements. Virtualizing these exceptional devices was a natural progression. Accedian’s engineering team migrated management, test control, and results processing functions—already running on Linux on each Element’s CPU—to a centralized controller, while porting wirespeed processing to the latest generation of FPGA1 programmable processors employed in Accedian modules. In this way, VCX assumes “CPU functionality” for thousands of Performance Modules, each acting as a “remote port.” VCX also maintains synchronization information for each endpoint, permitting highly precise one-way measurements over a variety of remote locations. Each Module can perform service activation testing (SAT), traffic conditioning, standards-based OAM, and performance monitoring (PM) under the control and command of VCX. Accedian’s patented dual-plane packet processing architecture is retained in the Module design, allowing these miniaturized devices to generate full line-rate test traffic, and maintain thousands of PM sessions per unit. The result encompasses the functionality of Accedian Performance Elements and PM Actuators in the smallest possible form factor, at a fraction of the cost. Unique to Accedian, our performance modules are capable of full line-rate test traffic generation, with the ability to create and analyze up to four unique flows, or run four concurrent RFC-2544 / Y.1731 service activation tests to multiple service endpoints. This allows enterprise IT teams to test the actual service path at peak hours, without impacting the network more than the service itself would. Standards-based TWAMP and Service OAM (SOAM) performance monitoring can be conducted in real-time over multi-vendor, multi-domain, and multi-layer networks using any combination of Accedian elements, modules, software agents, and multi-vendor networking hardware supporting standards-based reflectors. Thousands of sessions can be maintained by a single instance of SkyLIGHT VCX amongst its virtualized modules. Real-time statistical derivatives of key metrics, including percentile and min/max/average values, are calculated by VCX in real time as results are processed, eliminating querying delays when using these higher-level KPIs in fault management and reporting applications. Modules are cost effective enough that they can be installed at all key points along the service path to provide per-hop as well as end-to-end service visibility. A patented segmented test method provides per-segment results using a single test packet, eliminating errors in calculated results measured from test sessions. Enterprise IT teams face a tough challenge when they find their complex, high-speed data center and hybrid cloud infrastructure does not live up to performance expectations. Understanding what’s needed to remedy these problems requires instrumentation that monitors network performance end-to-end, from branch sites to hybrid cloud, from physical servers to a remote workforce. SkyLIGHT provides seamless actionable insight into all locations and layers, across the entire application chain. Real-time performance management analytics reveal application and network dependencies to pinpoint and predict any impact to user experience. Powered by exceptional scalability in the smallest possible footprint, time to value is accelerated by the simplest setup and user experience. SD-WAN provides advanced visibility of application performance across the WAN. However, the network measurements are round trip and do not provide the level of accuracy, granularity, and real time measurements of segment by segment performance. 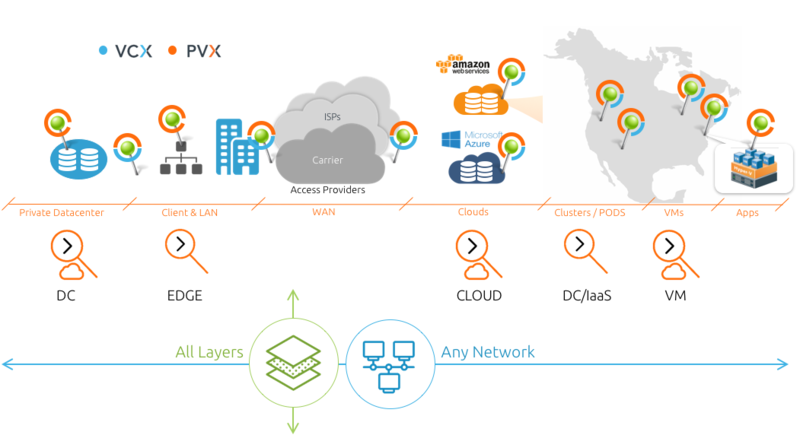 SkyLIGHT VCX provides this visibility of the underlay network in complement to the application QoS over the WAN provided by SD-WAN monitoring. The SkyLIGHT architecture is the future of Accedian solutions. It’s an innovative platform, easily extended with new Virtual Network Functions (VNFs) from Accedian and best-in-class vendors. VNFs can be developed rapidly, then transparently distributed by VCX. Accedian continues to introduce exceptional new monitoring capabilities on this platform, covering application-specific QoE, lossless remote packet brokering, sync monitoring and delivery, SLA-assured web application delivery, and more. SkyLIGHT VCX is future-proofed— join us for the journey.